Art in the Park | Uncommon Mariners – Welcome to the World of Mariners, Pirates, and the Eternal Sea! Happy Veteran’s Day to all those men and women who have sacrificed so much so that all of us Americans could enjoy our freedom. Whether you served in the Army, Navy, Marine Corps, Air Force, or Coast Guard, our debt to you is profound. We honor and respect you and thank you for the freedoms we enjoy. Arrrrgh! Sorry I be’s late with this communicado, but me and me pirate wench have been held incommunicado this past weekend. We were bivouacked at the Waccamaw Artists Guild’s Art in the Park at Chapin Park, Myrtle Beach, South Carolina. My wife creates Little Books of Mirth that she absconded from fairies who live in the woods behind our humble abode. She learned that trick from the best of pirates. But she be just as famous for her beautiful shell wreaths made with shells from beaches around the world where many a pirate and mariner have been marooned. As fer me, me art comprises of photographs I took while pillaging’ and plunderin’ from Cape Cod to the Caribbean. One of me favorites is a diorama I discovered celebrating Homer Pyle’s painting Marooned. 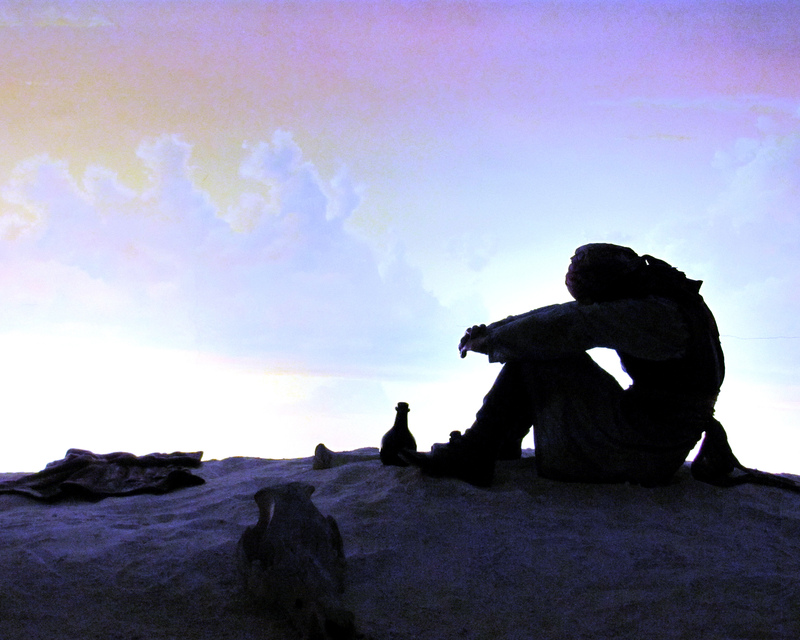 It depicts a solitary pirate sitting on an abandoned beach, a bandana wrapped about his head, shoulders slumped, lost in thought, no doubt contemplating the events that led to his situation. No doubt, one of those somber thoughts, is about what is to transpire with no worldly possession in reach other than a swallow of rum and a pistol. Ye see, mates, pirates were frequently marooned on an inhospitable island with nothing more than a bit of rum and a pistol with one ball to speed his end at his own hand. It was a fate assigned to that pirate who didn’t play well with other pirates. Howard Pyle is also known for two other easily recognizable paintings of pirates. One is of a blindfolded man, hands tied, ready to walk the plank. In the background, several pirates leer gleefully, exhorting the victim to the edge. No doubt, Pyle got his ideas of pirates from Robert Louis Stevenson’s Treasure Island and Alexander Exquemelin who served as physician among pirates. While Exquemelin’s embellished accounts in The Buccaneers of America are grounded in fact, Stevenson’s poetic license resulted in the creation of several pirate myths that thrive to this day. The truth is there are only one or two accounts of pirates making their victims walk the plank. Not being well known for their patience, pirates devised a much quicker method of disposing of unwanted mariners. “Run a saber through the bloke and throw the body overboard. Alive or dead. Makes no difference to me,” pretty much captures their attitude. However, considering that some captains and crews were, indeed, sadistic, it’s not hard to visualize pirates delighting in the torment of a blindfolded victim teetering on a plank extended over the sea.